Scott Disick and Kourtney Kardashian have been having problems for a few months now, but could anyone predict that he would leave boring Kourtney for her sister, Khloe Kardashian? 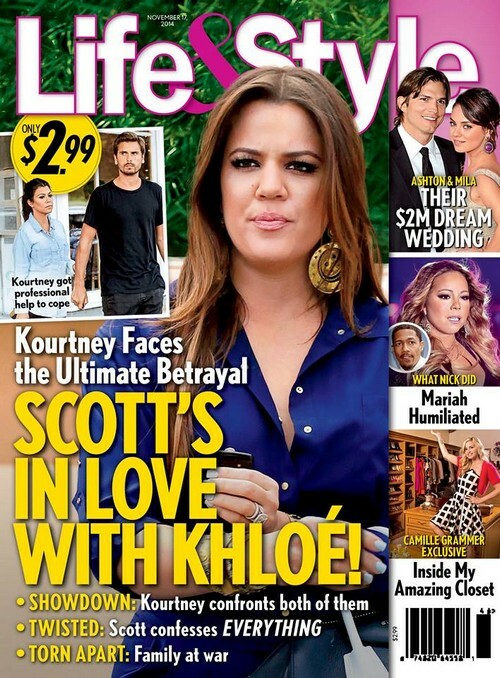 According to the latest cover issue of Life & Style Weekly, Scott Disick is in love with Khloe Kardashian, and has been for some time now. The report further claims that Kourtney Kardashian confronted both Scott and Khloe about these feelings, and Scott supposedly ‘confessed’ everything. And now, the entire Kardashian clan is reportedly ‘at war’ with each other. So basically, it’s another, normal Wednesday in the Kardashian household. I don’t doubt that the Kardashians have their share of ridiculous problems, considering their place in the reality TV world. However, Scott Disick’s relationship issues with Khloe Kardashian are all stemming from his alcohol abuse and his constant partying. He may have flirted with Khloe now and again, which I’m sure pissed off Kourtney to no end. And while I don’t doubt that Khloe would hook up with her sister’s boyfriends/ex-boyfriends, I don’t think Scott Disick would have been brave enough to make a move. That guy is the definition of a wimp, and he doesn’t have the balls to hit on Khloe. In other news, Ashton Kutcher and Mila Kunis are reportedly having a $2 million dream wedding following the birth of their daughter, Wyatt Kutcher. Well, let’s see if this marriage lasts longer than Ashton’s marriage to Demi Moore. Finally, Mariah Carey is reportedly ‘humiliated’ over all the Nick Cannon gossip, and she hates knowing that the public knows about Nick Cannon’s philandering and cheating ways. That’s why she has been trying so hard to find a rebound, but is anyone willing to put up with her diva-ness? We’ll have to wait and see.